We found out that instead of shopping for pink flowered clothes like I expected that I will be trying to hunt down cute things for a baby boy to wear this Fall. There aren't always a lot of great options, but Polly has come up with some pretty fun DIY Nerdy Baby Onesies that are pretty fun. These radioactive pants are pretty great. Even if you aren't having a little one of your own, they would make a hilarious baby shower gift. 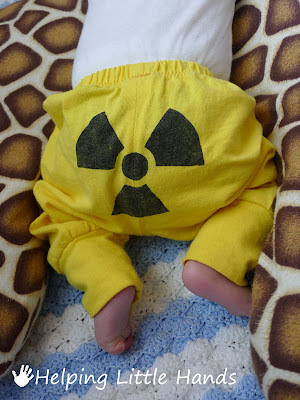 You can check out how to make a radioactive baby outfit and the other fun DIY onesies over at Helping Little Hands. That is surely one of the top ten cutest baby pants EVER!